There are a lot of the handsets with different model in the market,sometimes you need to have a trial before to buy but you will feel pressure as you test the features in front of the sales person.Now,Tryphoneis a interface website that give you a try before you buy. 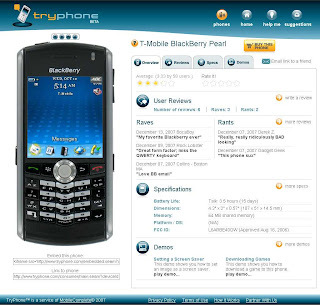 Tryphone have a interactive online virtual handsets to test drive mobile device,feature,application and function same as the real one.Due to the tryphone website still in beta version,there are 4 models available – IPhone,LG Muziq,Samsung Juke and BlackBerry Pearl. Hopefully tryphone can expand the phone type and become a dependable website.